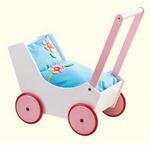 HABA's Blue and Red Doll Pram is just what kids want! Children portray what they see their parents and other adults doing, and want to pretend they are grown-ups and take care of their babies and their animals too! 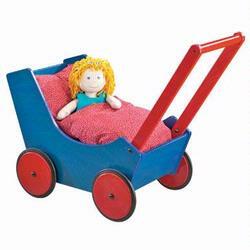 HABA's Doll Prams are great for pretend play. Made of solid beech wood, coated with numerous coats of clear, non-toxic lacquers. Wheels are trimmed with rubber, which makes them safe for wood flooring. Handles are adjustable, with an adults help. 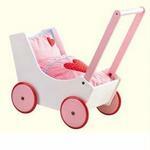 Pram comes with a matching pillow and blanket, to keep baby dolls and animals warm and comfy!